We regret that we cannot issue refunds on any cancellations. However, substitutions are permitted up to and including April 27, 2019. Please email a notice of any delegate substitutions to PSAC at accounting@psac.ca. 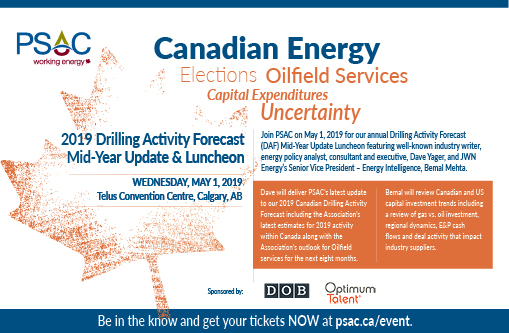 Join PSAC on May 1st for our annual Drilling Activity Forecast (DAF) Mid-Year Update Luncheon featuring well-known industry writer, energy policy analyst, consultant and executive, Dave Yager, and JWN Energy’s Senior Vice President – Energy Intelligence, Bemal Mehta. Dave will deliver PSAC’s latest update to our 2019 Canadian Drilling Activity Forecast including the Association’s latest estimates for 2019 activity within Canada along with the Association’s outlook for Oilfield services for the next eight months. Bemal will review Canadian and US capital investment trends including a review of gas vs. oil investment, regional dynamics, E&P cash flows and deal activity that impact industry suppliers. Register on or before April 14, 2019 for early bird pricing! Tickets will be emailed to you after your order has been processed. (Note: GST will be added to subtotal.) Limited seating available! 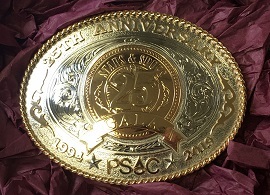 If you are having issues registering online, please contact us at 403.264.4195 or accounting@psac.ca.